It's #Throwback Thursday once again, that day of the week when everything old becomes new and the darling of the social media world! This week I thought I'd share a bunch of photos that an aunt of mine took of me, my sister and my cousins back in the 80's when we were teenagers. Ah, those were the days. You'll definitely be able to weed out the true 80's kids with this magnet -- everyone will appreciate the dry humor, but only true fans will know it's from Beetlejuice! Caddyshack is the ultimate 80's comedy, and this custom golf ball (sold in packs of 3) will be a sure hit (or should I say a hole-in-one) with your friends. The Breakfast Club was one of my coming-of-age films; so many 80's tweens and teens identified with the characters in the film. The quote in the shirt below was one of the most memorable ones; even my daughter knows it! I don't know if it was my changing hormones, but watching E.T. reduced me to a sobbing mess. Remember Gremlins? This tote bag reminds fans that cute and cuddly doesn't always equal safe! One lucky Bonggamom Finds reader will win the Gremlins tote bag, courtesy of Cafe Press! Leave a comment on this post telling me your favorite 80's movie. This giveaway ends at 11:59PM PST on July 11, 2013; I will draw a winner at random on July 12 and post their name after they confirm acceptance. Continental US residents only. For additional giveaway rules, click here. Disclosure: I did not receive a sample or monetary compensation for this post. Thanks to Cafe Press for providing the giveaway prize. The views and opinions expressed here are my own. 1) All our kids have email accounts, but as parents we know all their passwords, and they are fully aware that we reserve the right to check their emails at any time (and we do). 2) The kids have various social media accounts -- Jammy is on Twitter and Instagram, 3Po is on Instagram, and The Pea is on Instagram, Pinterest, Kik, Vine and SnapChat. but they adhere to age restrictions (i.e. no one has a Facebook account yet since the minimum age is 13). I follow all their social media accounts and they follow me. I also know all the passwords to their social media accounts. 3) We don't allow them to give out any contact information online -- even their user names should not contain any personal information. 4) Only The Pea has a cell phone -- now that she is in middle school and bikes to and from school on her own, I want to be able to contact her. But her phone plan is extremely limited (Kajeet's $5 per month plan) so she can't really spend any time texting or chatting with her friends. I know it's a bit draconian and I intend to increase her talk/message/web time as she gets older, but for now I'm perfectly happy "forcing" her to access the internet on a wifi network -- she certainly does enough chatting and social networking with her friends from home! -- and being the mean/cheap mom. 5) No one has a laptop in their bedrooms (not even Alfie or I!). Since she can't really access the web from her cellphone, I've been a bit lax about letting The Pea stay in her room with her iPad to chat and network with her friends on Instagram/Vine/SnapChat (her 3 faves).... but I make it a point to frequently enter her room unannounced so she knows we're watching. 6) We talk about internet safety A LOT. Stories on the news and on the internet give us many opportunities for this! When stories about identity theft or hackers appear on the news, we talk to our kids about protecting their passwords and never sharing them with friends. When stories about teens who commit suicide appear, we talk to our kids about the forms of cyber bullying, how to handle cyber bullying if it happens to them, and how they might be doing the cyber bullying even if they think it's just a joke. When online scandals (Anthony Weiner) or feuds (anything Donald Trump tweets!) make the news, we talk to them about how posting certain kinds of photos online can haunt them forever, even if they think they've deleted the photos. As an organization committed to helping all kids have safe and happy futures, the Boys & Girls Clubs of America are fully committed to spreading the word about internet safety. 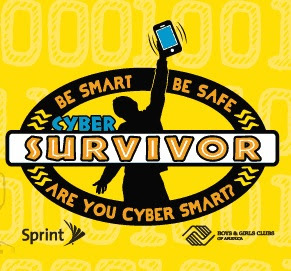 Their #CyberSafe Program, in partnership with Sprint, helps educate young people and their parents or caregivers on internet safety issues and ways to ensure that they have a safe, happy experience online. Their CyberSafe Futures website is a wonderful resource, with information on cyber bullying, cyber stalking, identity theft, sexual exploitation, and other online issues. 1) I should be Googling my children's names more often! I've Googled their names a couple of times, but information changes so quickly that it's good to check periodically. And it's not just articles or social media sites you have to patrol. In fact, just a few days ago I saw a baby photo of the boys on The Pea's Instagram feed, and she told me she got the photo just by Googling their names and looking through the resulting images! I was surprised at how many images of my kids came up when I Googled their names! 2) I should be setting my kids' Facebook privacy settings to "Custom". Okay, this doesn't really apply since all my kids are under 13 and none of them have a Facebook account.... but it's something that I should keep in mind once they do get Facebook accounts (and for The Pea, that's just 1 year away!). Setting their Facebook viewing privileges to "Friends" or "Friends +" still doesn't give you or your teen complete control over who sees their photos and posts. The quiz is just 7 questions, so it won't take up too much of your time, and as you can see from my own experience, it can be quite an eye-opener. Disclosure:This is a sponsored post on behalf of Mom Central Consulting for Boys & Girls Clubs of America. The views and opinions expressed here are my own. June 21 is the first official day of summer, and to celebrate, I've got a super-huge giveaway! I've teamed up with a group of bloggers to give away a brand spanking new Kitchen Aid Mixer! That's right, 1 lucky winner will win a KitchenAid Artisan 5 Quart Mixer – Choose from more than 30 colors! Open WORLDWIDE, 18+! If the winner is outside the U.S., they can pay for tax + shipping or opt for PayPal cash. Giveaway ends at 11:59 p.m. Friday, June 28. The giveaway entry form is at Pretty My Party -- don't forget to head over and enter! Good luck! 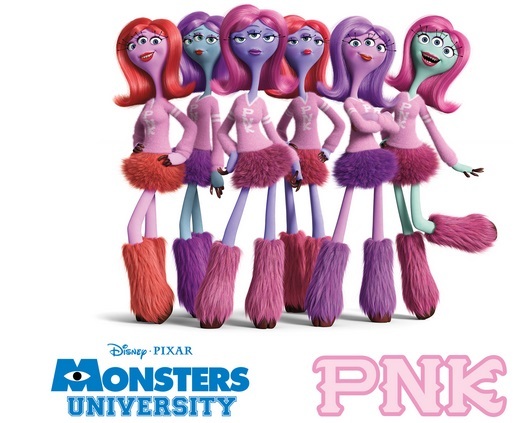 Monsters University now in theatres! It's June 21, summer is officially here -- and what better way to kick it off than by watching Monsters University! Over 12 years after the original movie, Monsters Inc, made its debut, Disney Pixar is releasing the prequel movie (the first time it has ever made a prequel!) so fans can find out how best buds Mike and Sulley ended up at Monstropolis' top scaring company. I was invited to an advanced screening of the movie so I've had a bit of time to digest its contents, mull it over.... and head right back into the movie theatre to watch it again! Yes, it was that much fun. 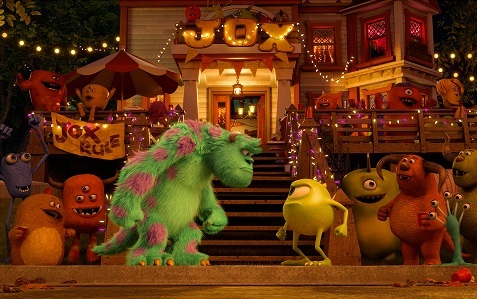 It was great to see how Mike and Sulley became best friends despite starting out as rivals in their Monsters U. days. In fact (Plot description follows! You've been warned! ), it's their rivalry that gets them kicked out of the Monsters University Scaring Program, the program Mike has dreamed of entering since he was a little kid. Desperate to avoid settling for the mind-numbingly boring Scare Can Design major, Mike strikes a bargain with Dean Hardscrabble, the Scare School dean -- if he and his Oozma Kappa fraternity brothers can win the annual Scare Games, she has to readmit him into the Scare Program.... but if they don't win, Mike is out of not just the Scare Program but Monsters University. Mike is forced to team up with Sulley and turn a team of misfits (think Revenge of the Nerds, monster style!) into winners. It's a plot made in movie heaven -- but Disney Pixar isn't known for being predictable, so watch out for a twist at the end! * The extra scene after the very last credit has come up on screen and disappeared. * The animated short that played before the movie, The Blue Umbrella, was beautifully rendered, but the plot was too similar to the Academy Award-winning short film Paperman, which showed before Wreck-It Ralph. 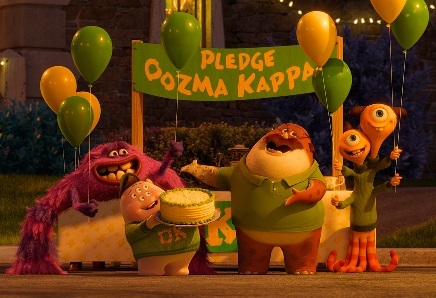 * I wish there had been a bit more in the movie about Sulley's relationship with his dad, who was a famous scarer -- for example, he could have had a marble bust dedicated to him in the College of Scaring, or his portrait could have been in the Scare Hall of the Roar Omega Roar frat house. * I wish (Major Plot spoiler follows!!!!) Dean Hardscrabble had given Mike and Sulley a second chance. Despite those misgivings, I loved the movie and will probably buy it when it comes out on DVD. Here's a fun trailer of Monsters University you should watch -- and I do mean you should watch it, because it has a few scenes that aren't in the movie! 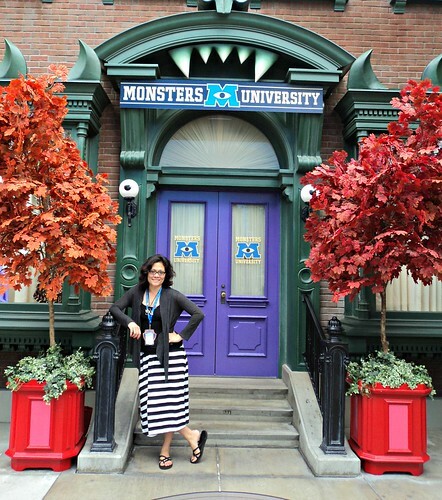 Disclosure: I received a pair of passes to an advanced screening of Monsters University.. The views and opinions expressed here are my own. Jammy has his tub of popcorn all ready in his hand, along with a beach ball to throw into the crowd! The Pea is feelin' groovy with her new sixties beehive 'do! 3Po is ready to surf the waves with the rest of the Teen Beach Movie surfers! Teen Beach Movie channels the spirit of classic teen romance and beach movies like Grease, Gidget, Beach Blanket Bingo and West Side Story.... especially West Side Story. In fact, the two main characters, Brady and McKenzie, actually find themselves magically swept into a beach party movie with pretty much the same plot as West Side Story, except it's set on a beach -- so it's "Wet Side Story", get it? -- and the rival gangs are the Surfers and the Bikers instead of the Jets and the Sharks. It's a fun family flick that's sure to get everyone shimmying and shaking, so don't miss it! "Teen Beach Movie" follows teen surfing sweethearts Brady and McKenzie who together ride the last wave of summer, one that mysteriously takes them into a classic beach party movie, “Wet Side Story.” There, it's surfers versus bikers for control of the beach hangout…and everyone spontaneously breaks into song and dance. Now, Brady and McKenzie must try to return to present day, but their lives may be changed forever when they inadvertently alter the movie's romantic storyline when handsome surfer Tanner falls for McKenzie and biker girl Lela starts swooning for Brady. 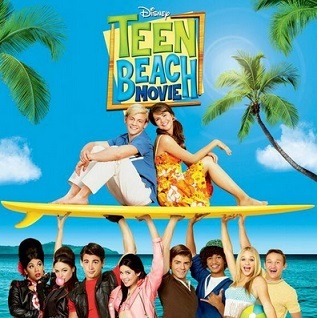 "Teen Beach Movie" will premiere July 19, 2013 (8:00 p.m. ET/PT) on Disney Channel. Find out more on the Disney Channel website -- and don't forget to follow @DisneyChannelPR on Twitter and Instagram, and TeenBeachMovie on Pinterest using #TeenBeachMovie! Disclosure: I received beach-themed promotional items from Disney Channel via Child's Play Communications. 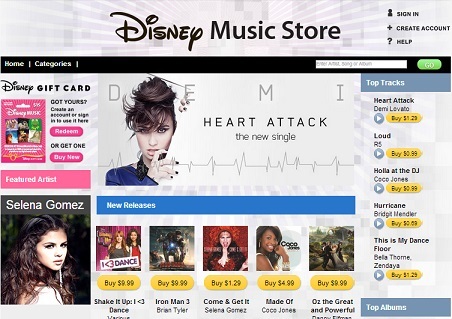 Movie information (in italics) is provided by the Disney Channel via Child's Play Communications. The views and opinions expressed here are my own. Lets face it. We women, especially moms, have an issue with our bodies. We’re constantly finding flaws – whether it’s our hips, buns, or even the backs of our knees. Having these types of thoughts often prevent us from wearing certain styles, cuts and colors that we envy others can wear beautifully and with confidence. “Oh, she looks amazing in that dress, but I would never be able to pull it off because of my ____________ ________ “ (insert excuse here). Take the trendy bandage dress, for example. They are flattering, flirty, and very fashionable. So why wouldn’t you wear one? LightInTheBox.com says the key to the bandage dress is that it keeps everything defined and under control and suggests a high V-neck dress that covers and zips up the entire back, has sleeves that hide the shoulders and arms, and conceals and defines the behind. LightInTheBox.com suggests a boat neck dress that keeps the chest area covered and in control, but still accentuates “the girls” just in a more subtle way. LightInTheBox.com says you can look sophisticated and successful in a bandage and suggests a scoop neck, short sleeve dress that is cut just above the knee. LightInTheBox.com says this one is definitely not brain surgery people! The simple solution is – wear a long dress that goes all the way to the ankle. Wow…that was easy. LightInTheBox.com says have no fear, my dear, the beauty of the bandage dress is that it contours whatever curves you do have, and suggests a dress with a slight, but not too revealing V-neck, and a short skirt to draw attention to your other assets like your long legs and cute behind. Disclosure: LightInTheBox is sending me a complimentary dress as a thank-you for posting. All information on this post is courtesy of LightInTheBox. For Disney music lovers like me, finding our favorite songs was a bit like a scavenger hunt. Record stores like Tower or Virgin (remember those?) had a specialty section, but it was pretty sparse, so I had to resort to mail-order catalogs or cd-of-the-months clubs. Then came e-commerce, and all of a sudden we had the opposite problem. Search for "Disney" on Amazon music, and you'll get over 8,000 results. Who has the time to sift through all of that? Baby Einstein music for playtime, naptime, travel and more for the littlest classical music fans! Music from the Disney theme parks: the soundtrack to California Screamin', the Haunted Mansion, Soarin' over California, the Golden Horseshoe Review and other beloved attractions. They have every Disney song you can think of, and many you never knew existed (Disney Princess lullabies? The Broadway recording of Mary Poppins? A remix version of Pirates of the Caribbean? Check, check and check!). Of course, it's Disney, so all the music is family-friendly and you can feel safe letting your child browse around the site. You can pay for your Disney music downloads via credit card, or buy a Disney music gift cards, with face values of $15, $25 or a custom amount. They are available at Disney resorts and retailers like Wal-Mart, Staples, Kroger and Safeway. 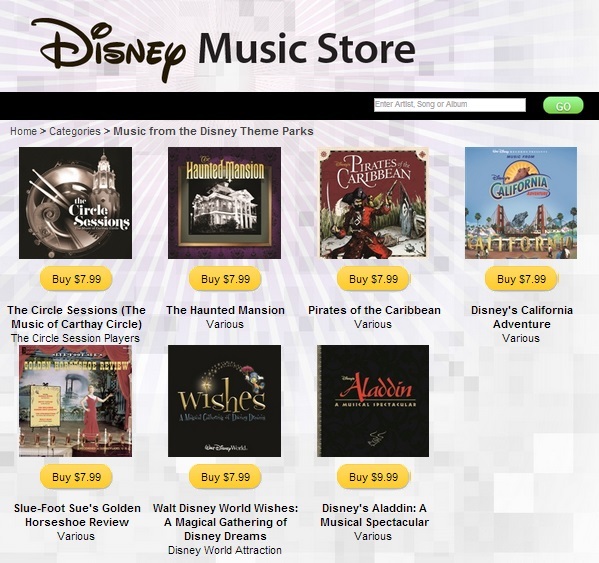 Just one more note: The Disney music store is not mobile compatible, and I have not been able to access the Disney music store on my iPad, so you'll have to download the music on your PC or Mac computer (it downloads in mp3 format) and transfer it to your phone or tablet yourself. 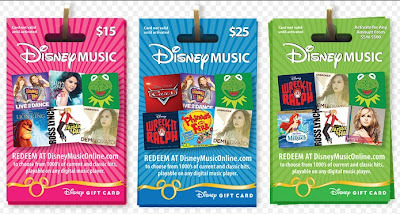 Disclosure: I received a Disney Digital Music gift card via Child's Play Communications as compensation for this post. The views and opinions expressed here are my own. 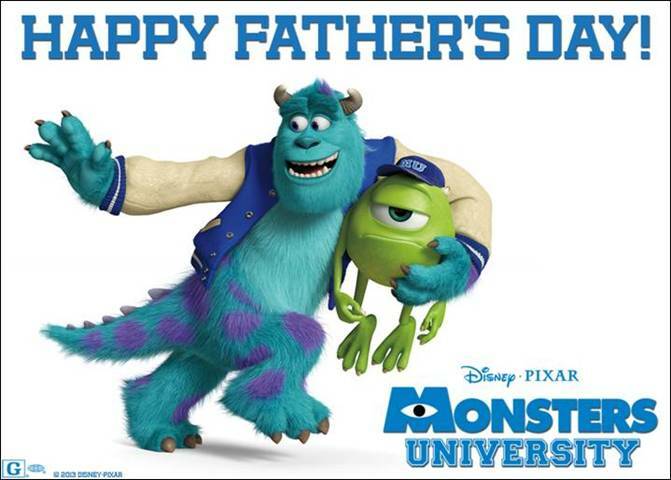 Just wanted to wish everyone a Happy Father's Day from Mike, Sulley and me! Happy Father's Day from Disney's Planes! 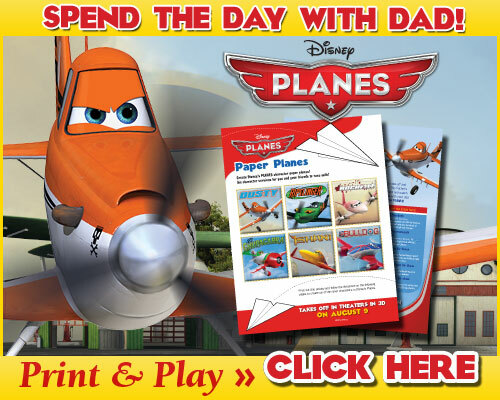 Father's Day is tomorrow, June 16, and Disney's upcoming Planes movie wants to help you celebrate with some fun activities and an e-card! 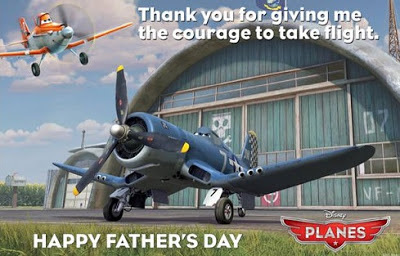 Enjoy, and Happy Father's Day! Cars Land has become one of my favorite places at the Disneyland Resort. It's hard to believe it has only been in existence for one year -- it seems like it has always been there! I almost can't imagine Disney California Adventure without the rugged mountains forming the backdrop of Radiator Springs. 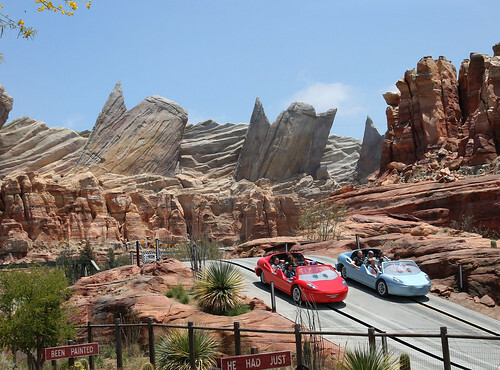 1) Radiator Springs Racers is definitely THE Must-Do Ride of Cars Land -- in fact, it's THE Ride of Disney California Adventure and possibly of the whole Disneyland Resort! It's extremely popular, and wait times can easily reach 90 minutes or more. Even the single-rider line reaches 45 minutes! I highly recommend lining up to get a Radiator Springs Racers FASTPASS as soon as you enter Disney California Adventure. FASTPASSES to this attraction can run out as early as 30-40 minutes after the park opens! But honestly, it's worth lining up to get the FASTPASS. It's really an amazing ride, with something for everyone: beautiful scenery, Cars characters and a fast, smooth race at the very end. 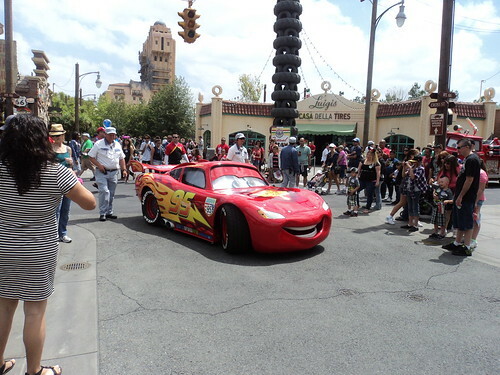 2) If you hang around the intersection where Ramone's Body Shop, Flo's V8 Cafe and Luigi's Casa Della Tyres are situated, you might catch Lightning McQueen or Mater strolling through town! There are also some great street entertainers livening up Radiator Springs with music and dance throughout the day (check the entertainment schedule for showtimes). 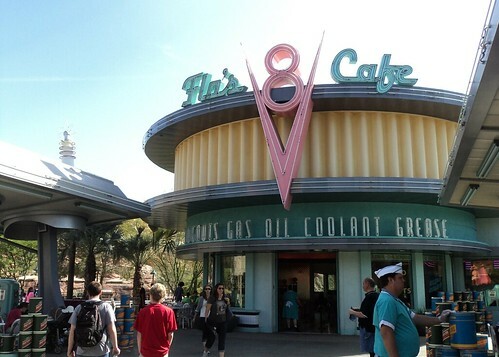 3) Flo's V8 Cafe is a wonderful place to beat the midday heat. I don't know whether people think it's a fancy place to eat so they leave it alone, but I've always been able to get a table there without any problems, no matter how crowded Cars Land is. The service is actually super-quick -- you order at a counter and they serve your food up right away, then you take it to a table and get a chance to rest your tired legs. In addition, you enjoy the most wonderful view of Ornament Valley and Radiator Springs Racers while you eat! 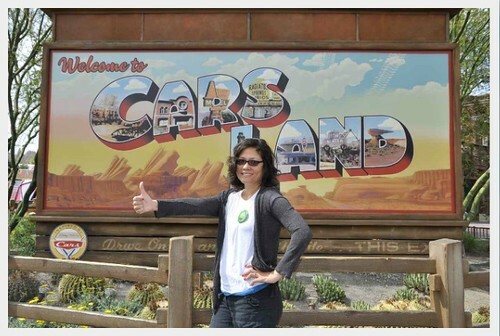 4) Want a free Cars Land souvenir? 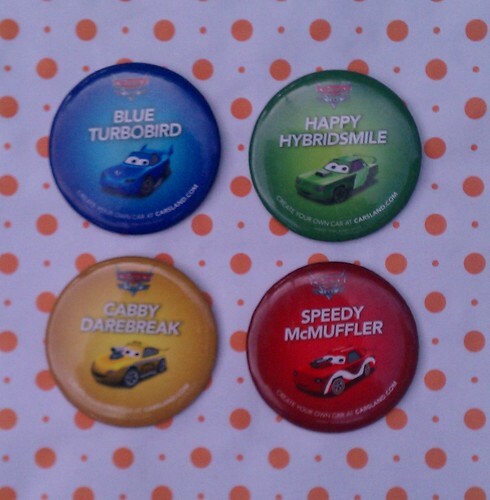 The last time I visited Cars Land, they were handing out free buttons at each of the shops in Cars Land! All you have to do is head to Ramone's House of Body Art, Sarge's Surplus Hut or Radiator Springs Curios and ask. You may have to answer a Cars-related trivia question, but if you've seen the movies it won't be anything you can't handle. If you're stumped, ask your children! I can't guarantee that they'll have these forever -- they may just be a summer 2013 promotional item -- but it never hurts to ask. 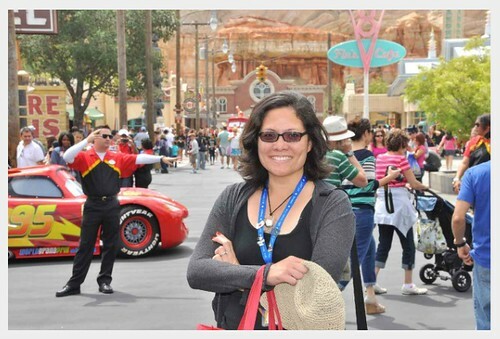 5) Make sure you leave at least 2 hours (and at least 3 hours if you plan to ride the Radiator Springs Racers!) 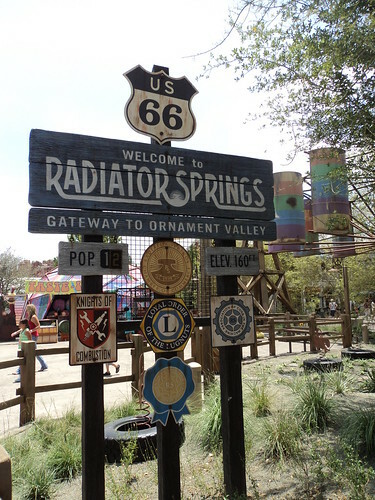 to experience everything Radiator Springs has to offer. You really auto swing by Cars Land -- I'm sure you'll be floored! Disclosure: The Disneyland Resort provided travel, park tickets and accomodations for my recent press trip to the Disneyland Resort. The views and opinions expressed here are my own.